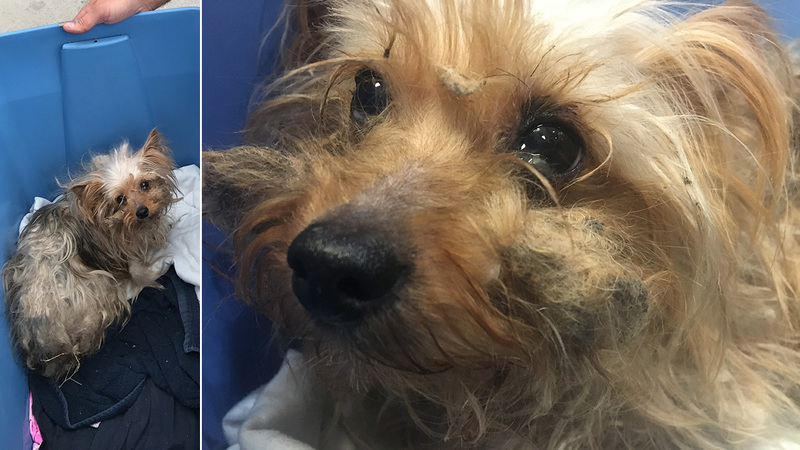 PARAMUS, New Jersey -- A tiny Yorkie is recovering after being thrown from a car on a New York highway earlier this month. The incident happened on July 5 on the Bronx River Parkway. The pup, now named Sydney, was rescued by firemen from FDNY Engine 63, Ladder 39 and Battalion 15 and taken to the Ramapo-Bergen Animal Refuge. Volunteers transported Sydney to Oradell Animal Hospital in Paramus. Officials say he was so matted and filthy that workers couldn't identify if he was a girl or boy. They say he was shaking in fear, unable to move much without pain. The emergency veterinarian at Oradell Animal Hospital examined Sydney, but because his coat was urine soaked and matted, it was difficult to fully evaluate him. Still, officials say he was sweet and affectionate. Sydney was found to have no obvious broken bones, but he had painful lacerations, rotten teeth, a heart murmur and nails that were at least an inch long and curled under. Doctors sedated Sydney in order to shave him and administer an X-ray and ultrasound for broken bones and internal injuries, as well as treat his lacerations. Those interested in making a donation to helps Sydney can do so at RBARI.org/Sydney/. People can also follow the Ramapo-Bergen Animal Refuge on Facebook or Instagram @rbarishelter. Authorities are also seeking the person or persons responsible. Anyone with information can contact execdir@rbari.org with possible leads.